You can watch the video tutorial here. Read on as we also share our top tips for perfecting your heat embossing…. 1.Allow the heat gun to warm up for a couple of seconds before using it, this helps to prevent the cardstock from warping. If the cardstock does warp, place it under a heavy book to flatten. 2. Use a dedicated heat tool rather than a hairdryer as this could blow the powders away rather than heating them to the desired effect. 3. Avoid overheating your design – you can see the embossing powder change as it begins to melt. 4. Always make sure your card is clean before starting to emboss your design. 5. Use tweezers to hold your paper if it’s tiny to avoid burning your fingers. 6. Experiment with different coloured inks and powders to as this can alter the finished effect, e.g. a silver powder on a blue stamped image will look very different to a green one. 7. Before adding the powder, run an anti-static cloth over the area. If you don’t have one of these to hand, May suggests using an old sock with talcum powder in the toe, firmly knotted! 8. Don’t hold the gun too close to the project – slow and steady gives better results. 9. If cracks form in your heat embossed design, then simply use the heat tool over the surface again which will melt design back together again! 10. You can apply the ink pad directly to the card or a die cut, like the love heart card below. Add a sprinkle of different colours to the inked area for a multi-coloured effect. This card has also had a covering of ultra-thick gloss powder. Stamping the image or sentiment in a clear ink and embossing powder and then inking over the top with a watercolour wash creates an eye-catching design. Ink a torn edge of paper with embossing ink and drag it through a small pile of embossing powder to create a lovely edge once heated. Will you be trying heat embossing? Let us know how you get on! 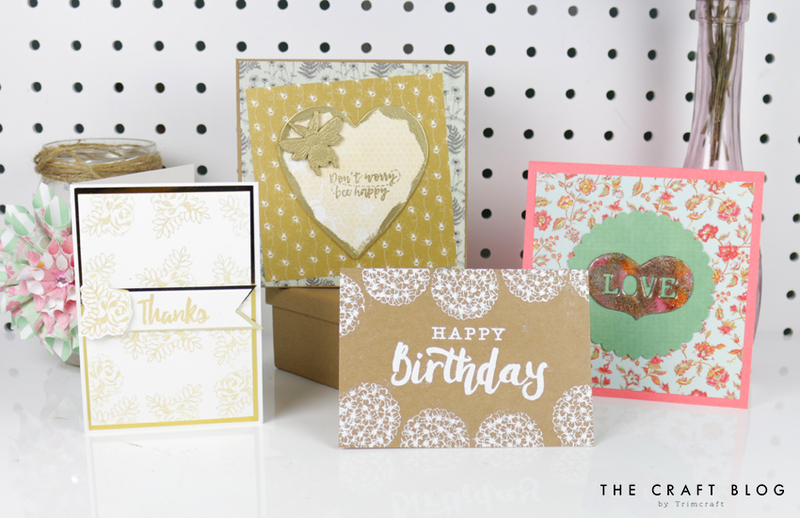 We’d LOVE to see your heat embossing projects, so don’t forget to #Trimcraft when uploading to social media and to share your projects in the Inspiration area. I´ve been using this technique for many years and still to this day, I´m always exited to see how it change, when I heat it up, and it really does create amazing looks and details to all kinds of work, and my advise will be to just play around and have fun, and you´ll be surprised, what really can be done with this. And another advise, if you don´t have the antistatic bag, then you can use an old used dryersheet, which I know, you have in the UK, it works perfectly, and yes I have tryed it.